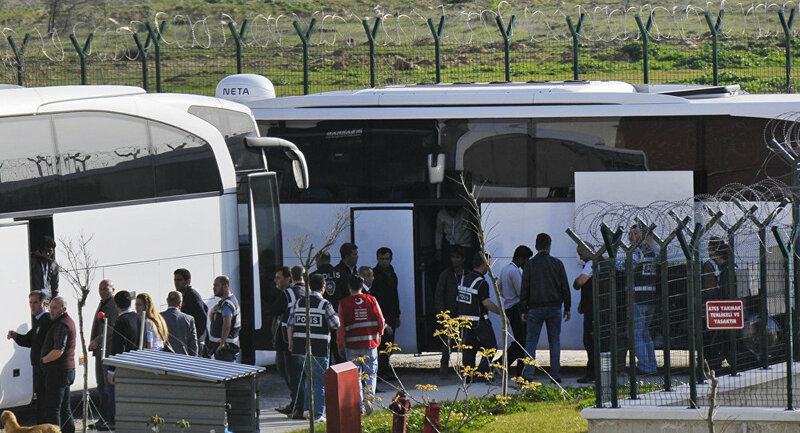 According to the Anadolu agency, citing security sources who spoke on condition of anonymity, that 40 undocumented migrants were held by Turkish gendarmerie forces in Tuzla village of Ayvacik district, while trying to cross into Greece's Lesbos Island. Later, the sources stated that in the same district the gendarmerie forces detained another 120 illegal migrants from Syria, Somalia, Pakistan, Afghanistan, Mali and Senegal. European countries have faced a severe migration in 2015, connected with the influx of people fleeing violence around their homes in the Middle East and North Africa. Turkey has become one of the major routes for migrants trying to reach Europe. As an attempt to tackle the migrant crisis, the same year the European Union introduced a relocation quota system. In March 2016, the European Union and Ankara agreed on a deal, under which Turkey pledged to take back all undocumented migrants who arrive in the European Union through its territory in exchange for Syrian refugees accommodated in Turkey, on a one-for-one basis. The European Union vowed to accelerate the Turkish EU accession bid, introduce a visa-free regime, as well as provide financial aid to Turkey to cover the costs of migrant reception. The agreement has resulted in the decrease of new migrants arriving in Europe, but at the same time, it prompted thousands of refugees to resort to unsafe routes operated by smugglers. However, as German magazine Spiegel reported in earlier this month, the deal is on the edge of collapse, as Germany, as well as some EU member states, have denied further payments to Turkey as part of the refugee agreement between Ankara and Brussels.